Ok, I am a day late for Design Wall Monday, Again. so, it is Tuesday. Here is a pic of the design wall. Look familiar... well it is. 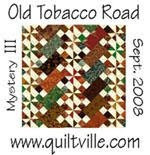 Still working on Gyleen's mystery quilt. I have all of the flowers made and all of the leaves attached, most of the connector triangles made. The next step is to sew the connectors to the flowers, make them into rows and sew the rows together. I have 2 weeks before the next step. Hope to be ready. There is a little knitting going on here, too. I started a pair of socks. Love this yarn. Will get a picture of sock in progress when there is enough to show. Two rows dont look like much on the needles. 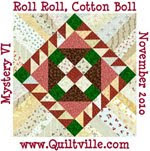 I am going to link up with Judy at Patchwork Times for Design Wall Monday, even if I am late. check out others design walls. Love your choice of fabrics. YUM! I love the bright fabric flowers! 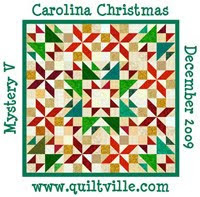 Do you know if Gyleen has published this pattern?